Stunning provincial election results Tuesday in Alberta -- home to Canada's vast oil sands region and fossil energy reserves -- upended the nation's political landscape, rattling the stock market and establishing a leader who is lukewarm on pipeline projects. The surprising victory of Rachel Notley, the premier-elect and leader of Alberta's left-of-center New Democratic Party (NDP), raises numerous energy questions critical for the country's emissions trajectory: Will there be any slowdown with oil sands growth? Will the premier's shift toward a climate change mitigation policy influence a U.S. decision on Keystone XL and bolster the country's climate reputation internationally? Will there be a major push for renewable energy in a province known for being Canada's equivalent of Texas? "I think we made a little history tonight" was the way Notley put it in her victory speech to supporters after the polls closed. Voters ousted the Progressive Conservatives, the right-leaning bloc that has controlled the Alberta Legislature since Richard Nixon was president of the United States, and threw out Alberta Premier Jim Prentice, the conservative leader who has ties to Canada's prime minister, Stephen Harper, and is a strong supporter of TransCanada's proposed Keystone XL pipeline. The NDP won 41 percent of the popular vote and now controls 53 seats in the Legislature, a dominant majority in the 87-seat chamber. Before the election, NDP had four seats and Notley was a relative unknown. Rachel Notley, leader of Alberta's New Democratic Party, who made dealing with climate change part of her platform, celebrates after sweeping to victory in the oil-rich province.` Photo by Nathan Denette, courtesy of AP Images. On election night, after thanking her team, her supporters and the outgoing premier, Notley gave a nod to the province's most powerful businesses. "To Alberta's job creators, great and small -- in the energy sector and in every sector -- our government will be a good partner with you to grow our economy and to secure a more prosperous future for every Albertan in every community," she said. "We need to start down the road to a diversified and resilient economy, to end the boom-and-bust roller-coaster ride we've been on for far too long." Notley has said she plans to improve Alberta's public image in addressing climate change impacts and examine royalties for the oil and gas industry. The NDP has stated it may raise corporate taxes to 12 percent from 10 percent. At a press conference after her victory, Notley specifically mentioned climate change as a priority, even as she emphasized reaching out to the oil industry. "We know that we need to do some work on the climate change file," she said. "We know that we need to have some conversations about the growth of our energy industry." Notley has indicated she wants to stop government lobbying for the Keystone XL pipeline and has been highly critical of the Northern Gateway pipeline, an Enbridge project that would shuttle oil sands product from Alberta to the Pacific Ocean. Yet she has been receptive to building the TransMountain pipeline, which would go to Vancouver, and TransCanada's Energy East pipeline -- larger than Keystone XL -- which would run to the Atlantic Ocean. Her rise to power comes as Keystone XL remains in limbo, awaiting action by the Obama administration. With Prentice's loss, Harper is losing a reliable ally on the pipeline and may have a tougher time making a 'full-bore' press on the subject, according to Keith Stewart of Greenpeace Canada. Yet Mark Cooper, a TransCanada spokesman, said in a statement that the company looks forward to working with Notley and her Cabinet. "Market access for Alberta's crude oil remains a top priority and pipelines remain the safest way of transporting large quantities of oil long distances," he said. In a call from Calgary, Sneh Seetal, a spokeswoman for Suncor Energy Inc., a Canadian integrated energy business, said her company is looking forward to working with the new administration. Enbridge has four refineries -- three in Canada and one in Colorado. While the firm has operations offshore, in the North Sea and in Norway, "our operations are primarily oil sands in Alberta," Seetal said. "The oil and gas industry in Canada works with governments of all political stripes at all levels of government, whether it's federal, provincial or municipal," said Jeff Gaulin of the Canadian Association of Petroleum Producers (CAPP), a trade association, according to Global News. "Obviously there is a lot of concern about what will the impacts be of a new government in Alberta on the industry," he said. "And we share those concerns." What Notley's platform on climate change means in reality -- and for the oil sands in particular -- is murkier. Currently, Alberta has a carbon fee of $15 per metric ton for facilities that don't reduce emissions intensity below a base line. Industry claims the fee indicates the province is far ahead of the rest of the world, while environmentalists allege it is too weak to slow projected growth in the oil sands, the country's fastest-growing greenhouse gas emissions source. There has been some speculation that a significant increase in the carbon fee could help Canada's position at global climate talks in Paris this year and provide a negotiating chip on Keystone XL. In December, the province delayed making an expected update to its carbon regulations (ClimateWire, Dec. 22, 2014). Stewart said the NDP might be inclined to raise the carbon price, but it hasn't outlined a specific per-ton amount. Some groups have pushed for a fee of $20 a ton or higher to make a dent on emissions. Indeed, the NDP platform is vague on the subject, saying it "will take leadership on the issue of climate change." A NDP spokeswoman said via policy proposals posted by University of Alberta School of Business professor Andrew Leach that there would be additional focus on things such as energy retrofits but did not outline details on oil sands climate policy, despite criticizing "our international reputation" on the issue. 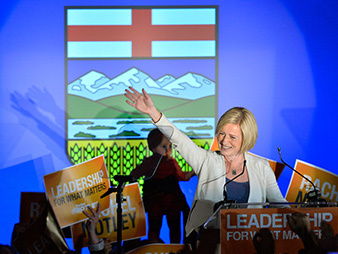 Most people didn't see Notley's election and the NDP landslide coming, according to Chris Severson-Baker, the Alberta director at the Pembina Institute, an environmental think tank. Members of the NDP have talked about phasing out coal and enacting policies to support renewables and energy efficiency technology, he said. "We're sort of waiting to find out what they do in terms of meeting Alberta's current 2020 target," he said. An independent environmental audit in October 2014 found "strong evidence" that Canada will not meet its 2020 target to cut greenhouse gas emissions 17 percent from 2005 levels (ClimateWire, Oct. 8, 2014). "Really what it boiled down to is Alberta has a revenue problem," Severson-Baker said when asked about top issues during the election season. "People are noting that the government's revenue is more and more pegged to the price of oil." The provincial economy is highly influenced by oil prices and the energy sector's health. And Prentice, the outgoing premier, was unwilling to consider adjusting the amount of royalties the provincial government takes in from the sector, Severson-Baker said, unlike Notley. "He refused to do that, and he also refused to increase corporate taxes," he added. "People were upset about that." Stocks swooned after Notley won. The S&P/TSX Composite index -- the headline index for the Canadian stock market -- lost a little more than 2 percent from election day until trading closed Wednesday. And the stock prices of the biggest energy companies with ties to the Albertan oil sands -- Enbridge, Suncor and TransCanada, as well as Imperial Oil Ltd., Cenovus Energy Inc., Canadian Natural Resources Ltd., Encana Corp. and Husky Energy Inc. -- have all declined since Notley's triumph. However, it's unclear what the result would be of Notley's pledge to review royalties paid by oil and gas companies or whether there would be any resulting slowdown in the oil sands industry's plans to more than double production by 2030. Asked whether Notley's policies would lead to a significant slowdown in those forecasts, Stewart said: "I'm not counting my chickens until they've hatched." He said he foresees a push for renewables and a faster coal phaseout, stronger environmental restrictions on the oil industry and climate considerations in decisions with energy projects generally, but "it's not like she's going to say, 'OK, we're shutting down the oil sands.'"